The Book Chook: Spreading the word - one magnet at a time! Spreading the word - one magnet at a time! Last week I wrote that I wondered how we can make a difference to child literacy and promote reading aloud to kids. One person who IS making a difference in her own special way, is Jen W, the Magnet Lady. If you live in Ann Arbor USA, you most likely have seen Jen driving around in a van with a big magnet on the side saying "Please read to your kids everyday." Here's an interview I did with Jen, who blogs at Eclectic Reader, to find out more about it. BC: Jen, you're passionate about children's literacy, and determined to spread the word about the importance of reading to kids. Can you explain what you did with your van? Jen: Well, I found this place on the internet called Vista Print (via either The Reading Zone or Two Writing Teachers blog entries, I don’t remember) and I started ordering post cards for my classroom in the fall. Then, I began wondering if I could get the “reading” word out with my personal stationery, etc. I made notecards that say “Reading is Good For You!” and I use them as thank yous as needed in the classroom. 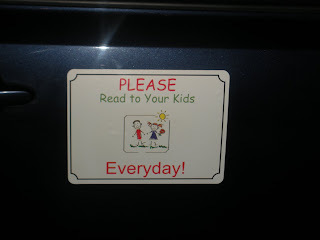 I also made a static cling for my van window that says “Reading makes you smarter- please read to your children everyday.” However, I really wanted to use Vista Print’s car magnets because I thought they were cool. So, I made a magnet that says: “Please read to your kids everyday.” It’s on my passenger side door, smiling at everyone I pass. BC: It makes me smile just to read about it! Tell us a little about the process with Vista print. Was it easy? Expensive? How have people reacted to it? Jen: Using Vista Print was both easy and cheap. I think the magnet was a “free” offer I got after ordering so much for my classroom. I just paid shipping which was about $6.50. It arrived within two weeks. The regular price is around $12.00 + S & H. The reaction has been great, but I hang out with lots of teachers who believe in reading anyway. My favorite part is that people get to see it as I drive all over town, sort of as a constant reminder of my “message”. In fact, some of my friends have asked where they can get them and I’ve just ordered another 4 in the same theme. I’m going to start giving them out to my friends so the word can be on more cars! BC: It's obvious you not only wanted to make a difference, you ARE making a difference, Jen. Do you have any tips for others who want to spread the word about how crucial it is to read aloud to kids? I love that story. I still encourage parents of seventh and eighth graders to read to/with their children every night, especially those who are struggling readers. Just today when I was talking to the mom of my daughter’s friend, we struck up a conversation about reading. Her 3rd grader was struggling and I asked her if they still read together. She said “no”. I told her that was the best way to improve her daughter’s reading and she seemed genuinely surprised (this woman does cancer research). We’ll see what happens. I just believe that it is SO IMPORTANT not to stop reading to your child once they can read on their own. I was reading Magic Tree House books to Abby (my oldest) when she was 4 and I do the same with her twin siblings. It’s amazing what kids can soak up even at that age! And it helps to prolong their attention span. BC: Why is this whole subject such a vital one for you, Jen? What do you see as the problem? Jen: The problem is complex. Parents are not all, for whatever reason, reading to their kids at crucial and critical ages. Most people don’t know they should begin reading to their children right away- they wait. In a child’s brain, by 3 years old, most of the synapses and neural connections are pretty much set for life. It is so important for them to be exposed to as many words as possible in that time period. I know people are busy and times are hard, but even 15 minutes of “lap time” and books each night or day is “do-able” for every parent. It makes such a huge difference! Studies show that by kindergarten, some kids have been exposed to about 50,000 words per day whereas others have been exposed to maybe 8,000 words per day. The latter group enters kindergarten with a deficit and that’s where our reading problems begin. Also, kids do spend a good deal of time in the car being carted around and many parents don’t realize how effective an audio book can be. This starts kids visualizing at an early age, which is also one of the problems lower readers have as they move up in school. Plus, you’re right there driving and can talk to them about what’s going on or rewind something they didn’t hear. It’s been an incredibly effective tool with both my own children and my students at school. BC: I am definitely getting my own magnet, Jen. It's such a neat idea - affordable, achievable and effective. Thanks so much for telling us about your own special magnetism. Jen: Thanks for having me do this, Susan. It’s been a pleasure to talk with you about reading. It's my favorite topic - after my kids!